Your small start-up deserved a top of the line printer. 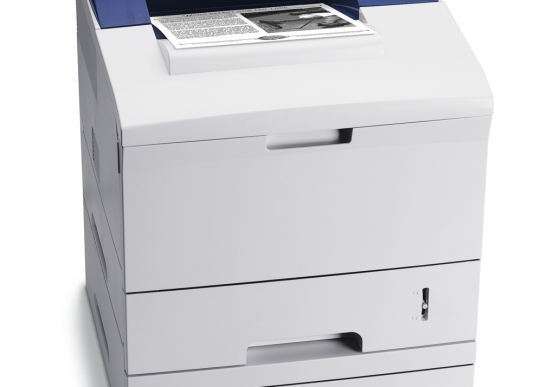 The Xerox Phaser 3600 black and white laser printer from Pacific Office Automation rises to the occasion and is the perfect machine for workgroups of 10 or less. Despite its compact size, this powerful printer has an impressive output speed of 40 pages per minute with paper handling of up to 8.5 inches by 14 inches. The Phaser 3600 has an advanced duty cycle of up to 200,000 pages per month, allowing your office to stay up-and-running without frequent interruption. Print functions are backed by a 400 MHz processor, a first page print time of 9 seconds, a standard paper capacity of 600 sheets (with the option to expand to 1,100 sheets), and the assurance that your documents will be printed quickly—even if they feature a large number of graphics or pictures. Users can print with equal quality assurance on a variety of media types including envelopes, labels, postcards, and transparencies at weights of up to 60 lb. bond. As you place your trust in your Xerox printer, you can be certain that your information will be kept private. With Secure Print, a functionality that keeps your print job waiting in the print queue until you release it with a password, your office can make sure that sensitive material is always safeguarded. A secure printing feature also allows users to protect the print queue with a PIN that employees must enter before print jobs are executed. For superior performance and unrivaled security features, the Phaser 3600 is the best printer for the job.